Polled. 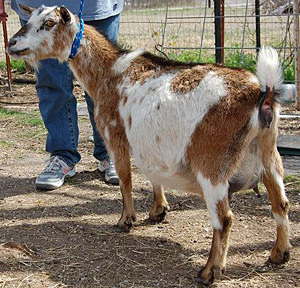 Surprise was our pride and joy and is still the cornerstone of our breeding program. 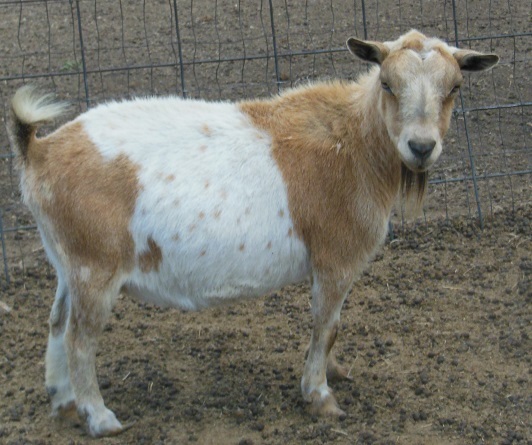 She was long and level, very elegant, with near perfect fore, rear and side udder attachments and good medial. She also had plumb milkable teats. At 13 years old Surprise was still freshening, still throwing dynamic, outstanding kids, and still had the udder of a 3 year old! This doe amazed me! She was exceptional in every possible way, and the epitome of what we are looking for in our breeding program. For this doe to have held up so well for so long speaks volumes. She was a perfect example of longevity of function! **Surprise passed away on January 4, 2005, from old age. 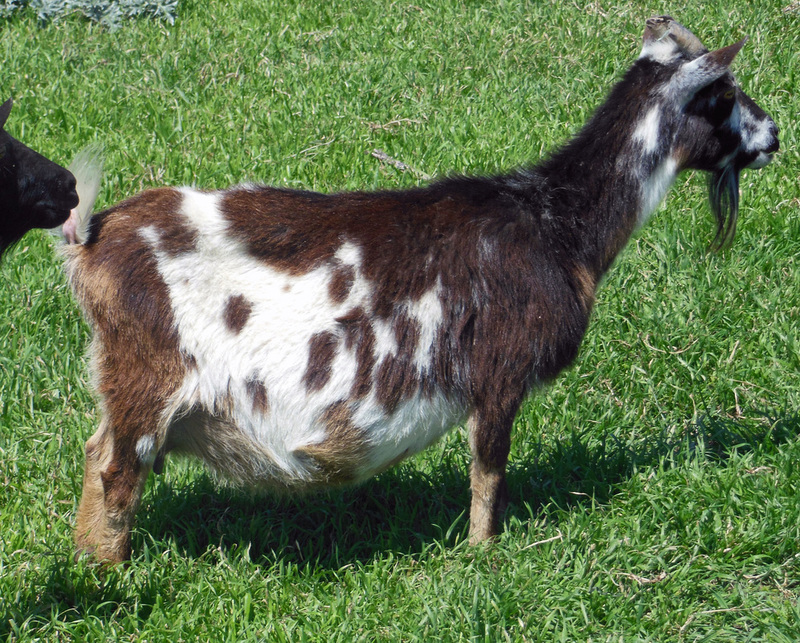 She will remain here, at the top of our website, as she will never truly leave our herd. Her blood runs deep here, and I will strive for the rest of my life to produce another such doe, and to do honor to her bloodline. 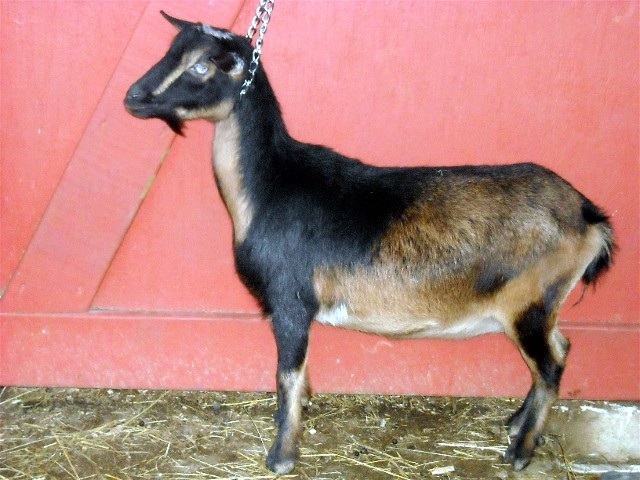 Surprise was the epitome of the Nigerian Dwarf doe, and will always be our ideal here at Flat Rock Farms. Not only did she earn her Master Champion award, she produced daughters and granddaughters as good or better than herself, including MCH/PGCH Flat Rocks Opal 2*D. She has produced sons whose daughters excel, and she earned her *D through her progeny, having 2 daughters with *D and a son with a +S. 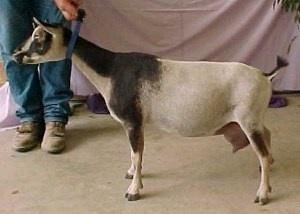 She was a productive doe in all areas, the show ring, the kidding pen, and the milk pail. Apart from her various accomplishments, Surprise possessed a giving and loving personality. She, as her dam before her, was my friend. To say she will be missed is an understatement. Surprise will be mourned. 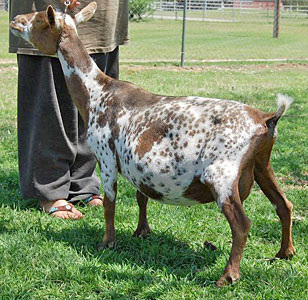 Littermate sister to Champion Design, Calico Rose was extra long bodied with a wonderful udder. You see it all the time, but this picture really does not do her justice. She was in the show ring once, and that time was her last, as she doesn't enjoy it and she makes sure everyone knows it. She was, nonetheless, a favorite around here. She was a gorgeous doe with a great pedigree who exemplified the functional longevity that we expect from our animals. We lost Callie in 2008. Polled. Wishbone is one of the nicest does we have - it's nearly impossible to find fault with her. Full sister to Celebration and littermate sister to Flat Rocks Dot Com, she is long and level with a great udder, and very tight shoulders. We're so pleased with this breeding, that we have repeated it several times and never been disappointed. Gin Fizz has really come into her own! She has tons of capacity, while maintaining excellent attachments as she ages. Fizz has a very broad area of attachment, with a perfect fore udder, and correct sized, very milkable teats with huge orifices. She also offers great rear udder attachment, with good medial and lateral attachment as well. She is a very wide and strong doe, who is also well under the height standard, being only 19.5 inches tall. At one point I had sold this doe, and I am thrilled beyond belief to have her back. Her dam, Flat Rocks Funny Bone, had an exceptional udder, and Fortune was her last kid. 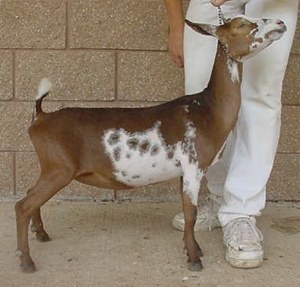 Fortune is not a show doe, but a very solid brood doe who produces better than herself. She has great legs and feet, good width, depth, and length, but she is loose in the shoulder. 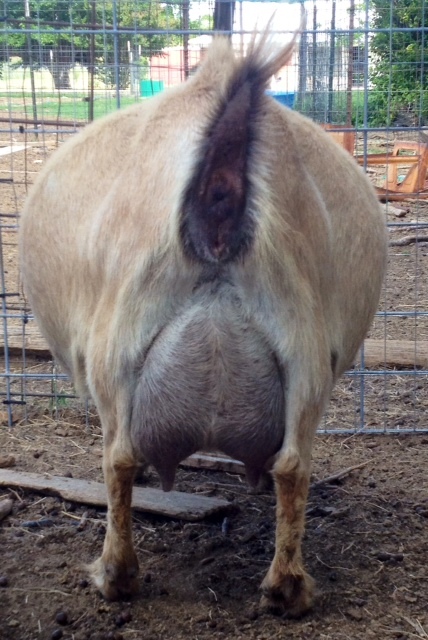 Her udder has tremendous capacity, but could use higher rear attachment. 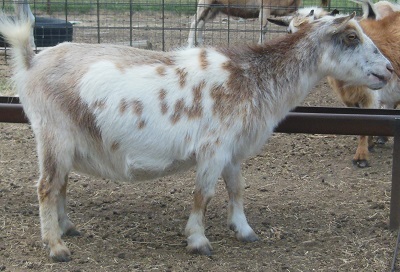 She has large, milkable teats, and a nicely extended fore udder. This is Satin, another doe to recently rejoin our herd. 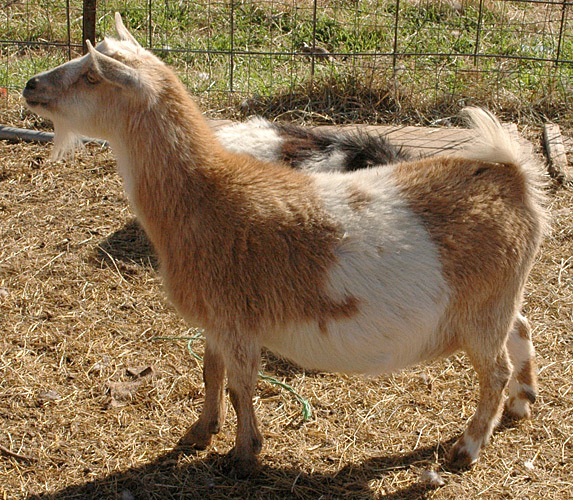 We feel that Satin is an exceptional brood doe, who consistantly produces kids better than herself. 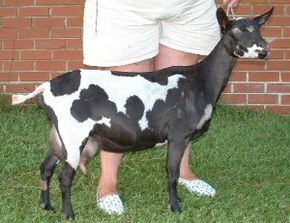 Satin is the dam to MCH Half Pint Acres Flora "E", the 2002 AGS National Reserve Grand Champion Senior doe. She is a lovely bodied doe, and this picture simply does not do her justice. We'll try and get a new one soon. 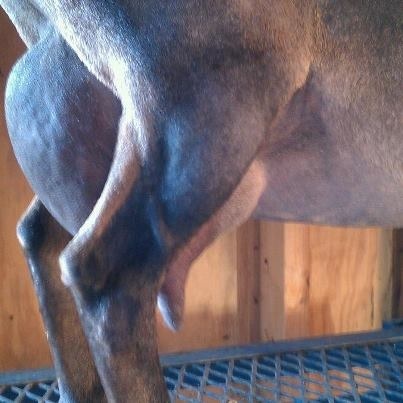 We would like to see Satin's udder higher in the rear, but we are quite pleased with other attributes in this doe. Hummer is a typical Gem daughter, but as our only Lexus daughter, is very precious to us. Very long and level, dripping with dairy character, and excelling in the mammary system. 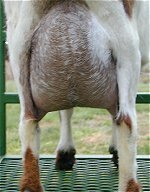 Her udder is well attached all around, with an outstanding udder floor and plumb, milkable teats. Hummer is small for a Gem daughter, being only 19 inches tall. Fiona taking a break. We think at 13 and heavy bred she's earned it! I've always loved Fiona's pedigree. 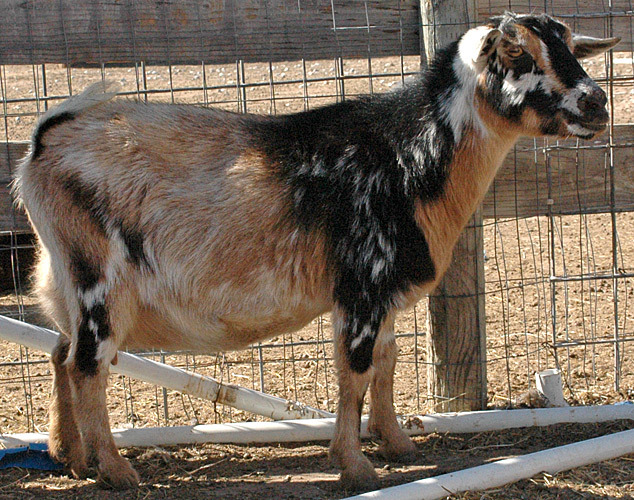 She's a cross between two different Surprise daughters and Munchranch Cactus Jack. She's pretty advanced in age now but still producing lovely kids. While the rest of her is showing her age her udder is still quite lovely and she still stands on great feet and legs. 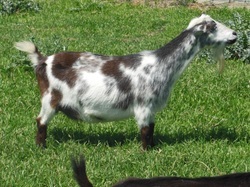 We have both her half sister (Gemma) and her daughter retained in the herd. Just 2 weeks behind her best friend Prism, Fiona went to take a nap in the afternoon of April 2014 and never woke up, we should all be so lucky. Polled. This is one of my favorite young does. 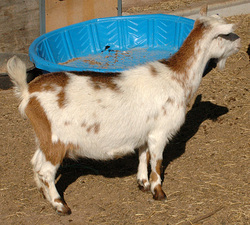 Boo is a near ideal Nigerian Dwarf. 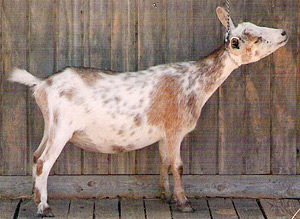 She displays both the dairy character and strength that this breed is noted for. Boo is long and level, very deep, and standing on excellent feet and legs. Boo lived with my grandfather for a while, who does not breed, so she was a very late first freshener. She has the outstanding udder typical of our Gem daughters. 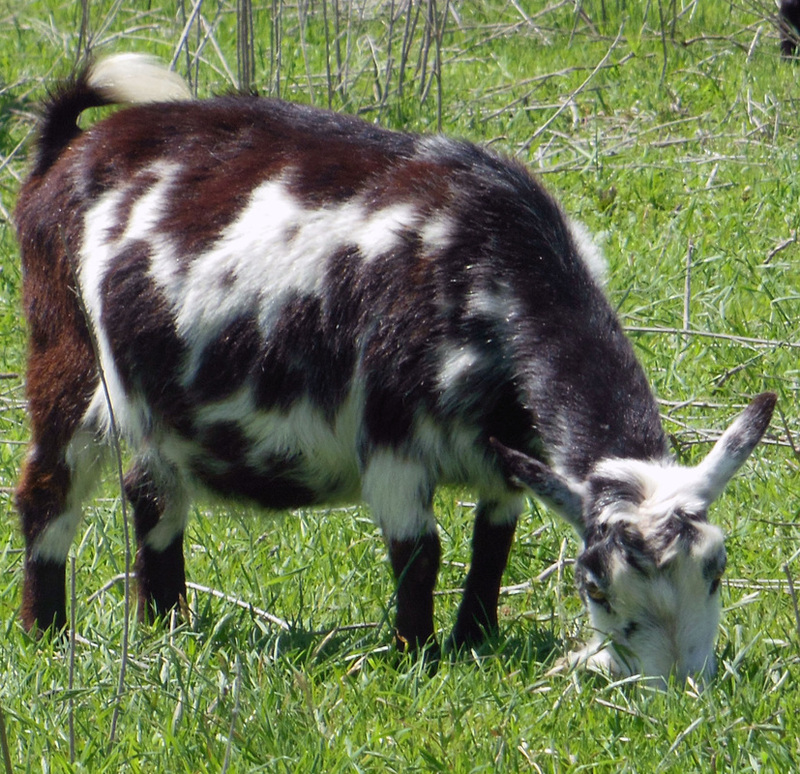 Standing in the pasture, she is built just like Sunshine. This is another doe that spent time at my Grandfather's and did not get bred at the proper time. She was a very late first freshener, but we expect great things from her. Structurally she is a dynamite doe, very put together, and just drips diary character. Her dam is a daughter of MCH Flat Rocks Surprise *D, and twin sister to Flat Rocks Flash “E”. 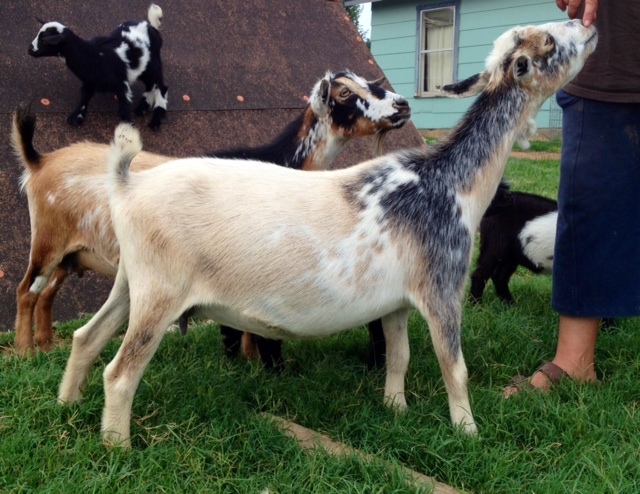 Shadow is closely line bred on our own FR Gem, and she is everything we expected her to be! This doe just has it all, she is structurally correct, showing great dairy character, and the style and grace we've come to expect from Gem. 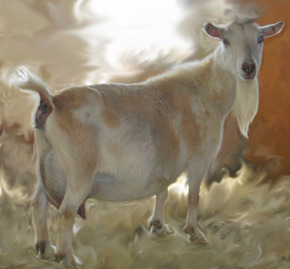 She reproduces herself as well, with two stunning daughters in New England, Flat Rocks Penumbra and Flat Rocks Golden Shadows, both with outstanding mammary systems and dynamite conformation. Polled. Keeper was a gorgeous doe. 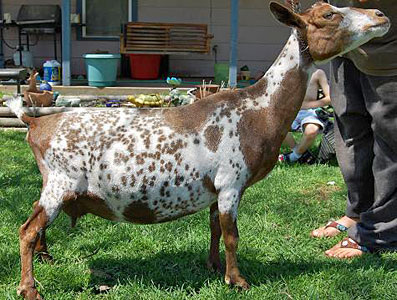 She looked just like Princess, but instead of black spots she had Kingwood red spots. She was just a really, really sharp angular doe. Her udder was just socked on, with attachment everywhere, and it only improved with each freshening right up into her 8th year. We lost Keeper in 2009, and we miss her greatly. Polled. 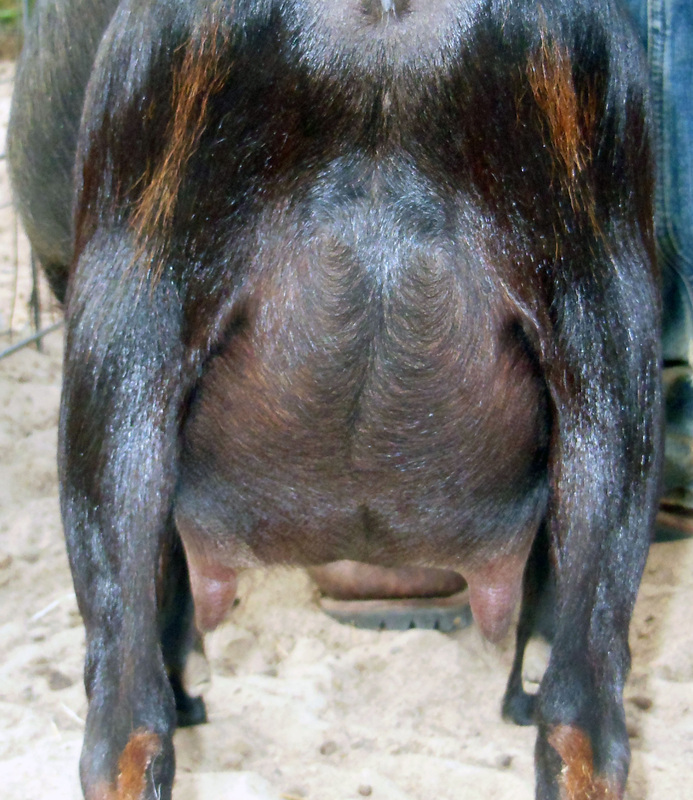 Prize Patrol is the combination of our top animals, MCH FR Surprise *D, and her son, Flat Rocks Flash +S "E". Prize Patrol has really come into her own as a mature doe. She has a lovely, wonderfully attached udder. We're very pleased with this little doe's development. also see Evie's full sister Ella Enchanted. 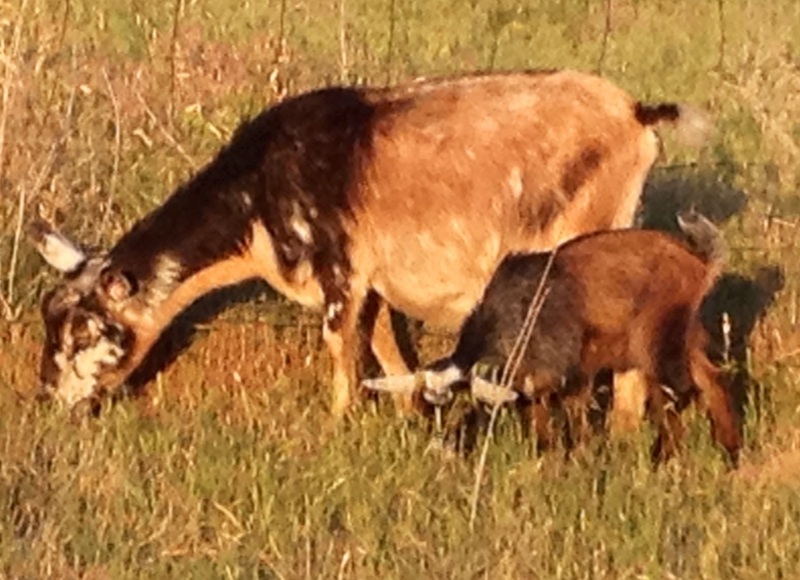 We love the breeding behind this doe and have been very pleased to add her to our lineup. She has absolutely perfect teats, and nice attachments all around. Polled Alias is my pride and joy. 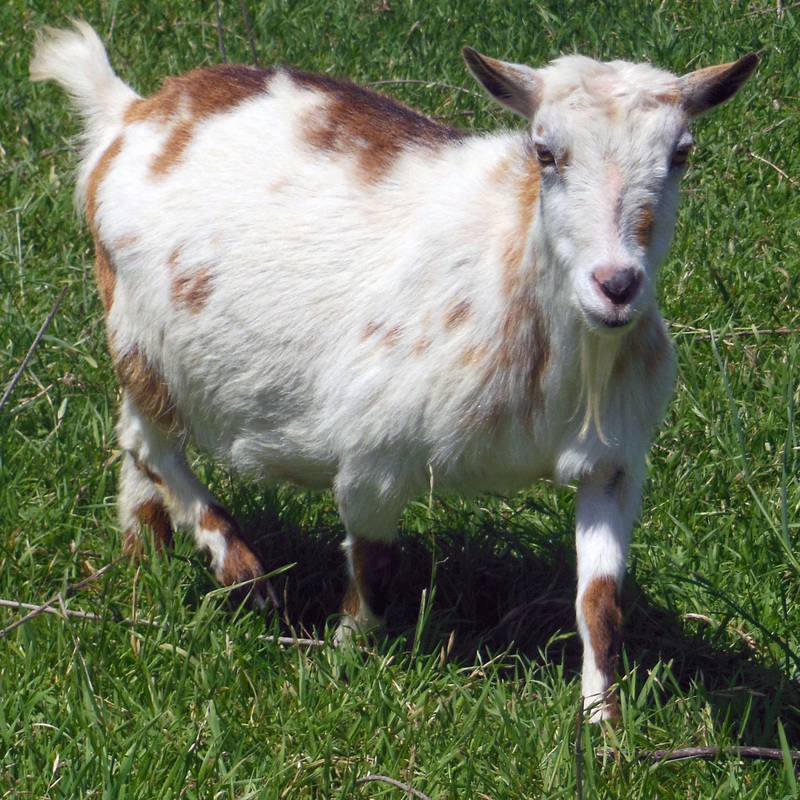 She is an exceptional doe, being very long and level, extremely wide, and just dripping with dairy character. She represents everything we've come to expect from a Gem daughter. Her udder is glued on and beautifully shaped. ​Hedwig is another Numbscull daughter, and shows us the same beautiful udder indicitive of the line. She's a smaller doe than her sisters, but still long in body and deep in barrel. Hedwig is retired from breeding but her daughter, Pigwidgeon, is absolutely stunning. Pigwidgeon was her last kid, and well worth the wait! We really love the bloodlines on this little doe! 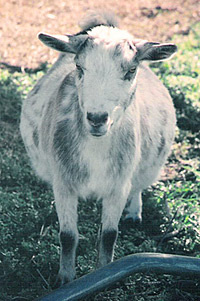 Her sire, Flat Rocks Numbscull, is the twin brother to our Flat Rocks Knucklehead who resides in the Velvet Acres herd. He is tightly line bred on our foundation doe, Willows Bone Head. Her dam, Flat Rocks Spoiled Rotten, has a lovely udder that is just glued on, and Prism is a knockout in the udder department herself. Udder shot has only 8 hours of milk. Prism went to take her afternoon nap, and never woke up, she leaves behind several daughters in our herd. Another very old pedigree on an exceptional doe. 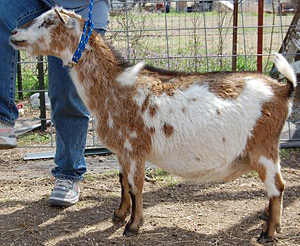 Grace has a lovely udder that has stood the test of time and LOTS of kids and milking. She routinely has quads. Another favorite on the milk stand. I really can't say enough about this doe. Still productive and still producing exceptional kids at 15+ years of age. 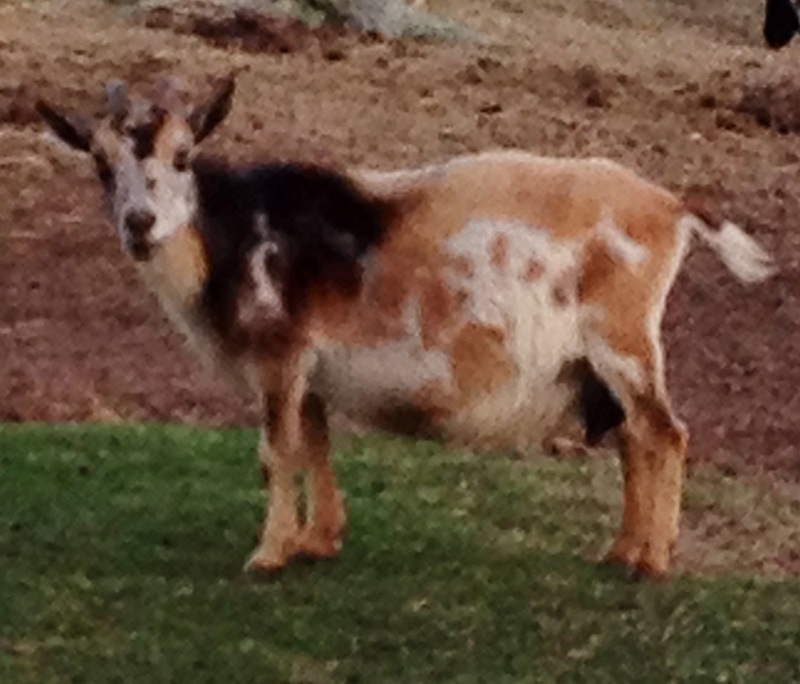 Grace has been a tremendous asset to our herd. We look forward to her 2018 kids, and to using her 2017 son, Flat Rocks Prince of Monaco, in future. ​Precious has developed into a power house of a doe. 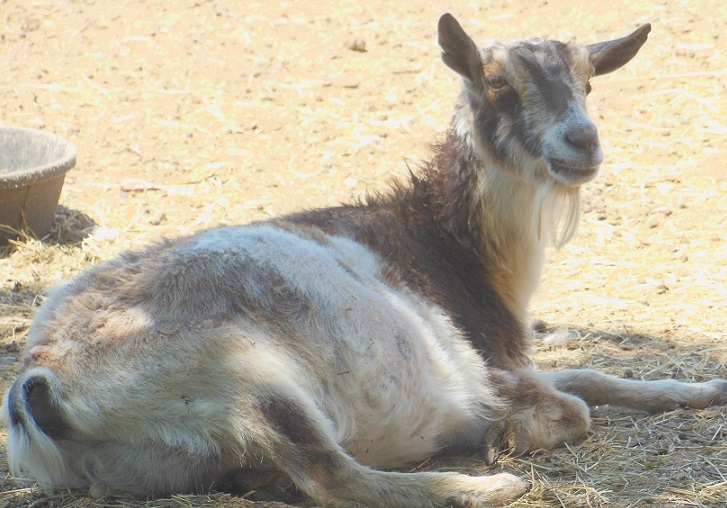 She's very similar to her half sister, ARMCH Flat Rocks Here For The Party *D E, who resides in the Dragonfly Farm herd in MA. 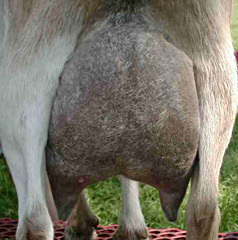 Her udder is absolutely outstanding with perfect laterals, medial and teats. Precious is herd Grand Dame, still beautiful, still and always in charge. Lucky is another favorite. She has tremendous capacity with large milkable teats. 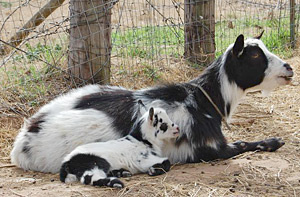 Lucky has become very influential in our herd through her daughter Groovy Girl. Groovys son, Valiant, will be one of our primary herdsires in future. This line is extremely tough, naturally parasite resistant and very productive. Coral carries some old and very august bloodlines! 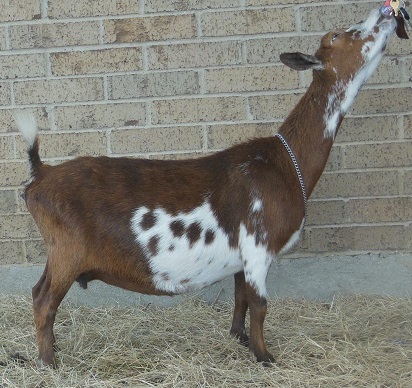 She's line bred on Goodwood Alamo Messenger through her granddam Goodwood Mermaid, her great granddam MCH FR Surprise and her other granddam MK Dinah. It's a tremendous old pedigree that you don't often see anymore. 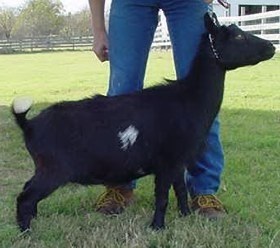 She's a tremendously deep bodied doe with capacity and attachment to boot. 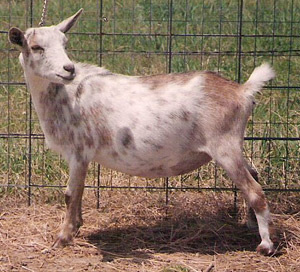 MCH Flat Rocks Fox Fire "E"
In my opinion the second most influential line in my herd (next to Surprise) is that of Flat Rocks Calico Rose. This is one of the few direct daughters I have left. 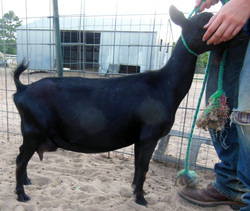 This line also produced Flat Rocks RoseByAnotherName, another MCH FR Fox Fire daughter. Outstanding udder on this doe, I really can't fault it. You simply do not find these bloodlines anymore. 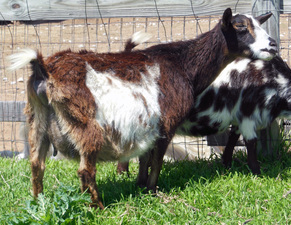 Leprechaun was a very influential buck in our herd. He died at 15 year old with kids on the ground. His daughters were consistently beautiful productive does. 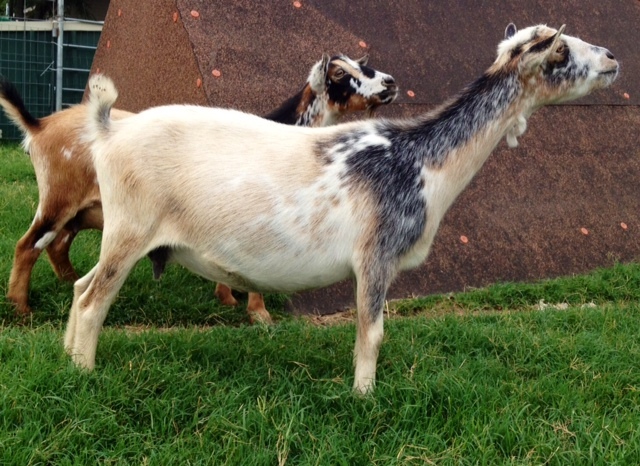 Tapestry has a socked on udder with perfectly plumb teats and orifices the size of pencils. No wonder she's one of our favorite milkers! Rhiannon's dam, Flat Rocks Oatmeal, pictures courtesy of Springs Run. Rhiannon is the daughter of one of the only Surprise daughters I ever let go of. Combined with MCH Willow Creek Shine she is a potent combination indeed Beautiful doe that everyone who comes here asks about. Rhiannon's 2013 daughter FR Arianrhod was awarded her milk star as a first freshener on ADGA One Day Milk Test. One of our absolute best does. Urchins twin sister, Flat Rocks Charybdis, resides in the Dragonfly herd in MA, and won Best Udder Nigerian at the 2011 ADGA National show. She and Urchin and very, very similar. Outstanding udder. Incognito is one of our top "young" does. She's absolutely beautiful with lots of length, depth and elegance. She may be the most level ND from thurl to thurl I have ever seen. Exceptional udder and dynamite to milk. This girl is a basic MCH Fox Fire/ Gem/Surprise cross. We've come to expect a lot from these lines. her registration number was D-376f. Considering Topaz is D-63,894h, we really have come a very long way. 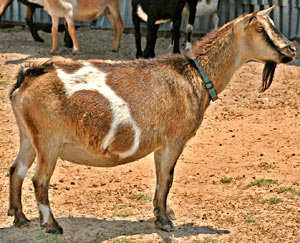 Topaz combines the strength and longevity of those old lines with the udder and capacity of the modern Nigerian. Another very successful cross for us. 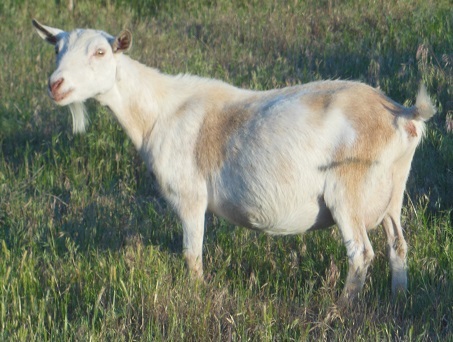 So successful that I repeated it over and over and kept most of the offspring, though enough got lose that this girl has two finished CH sisters. We have 4 does of this cross and one buck. Extremely elegant, dairy does with beautiful high and wide udders. I could go on all day. Grace is a beautiful doe with a lovely udder. She consistently produces beautiful kids. 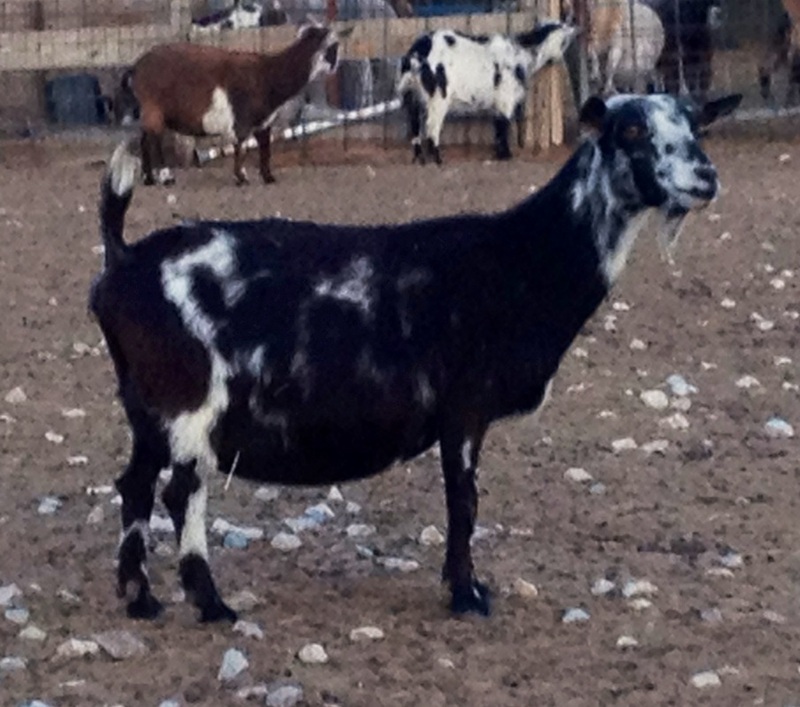 Gemma is a lovely example of a Gem daughter as well as a Surprise line breeding. 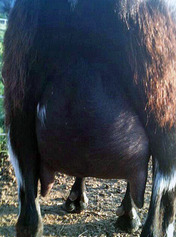 Her udder is wide and very well attached with lovely teats. This cross has been extremely successful for us. This doe is truly exceptional. Her udder is absolutely glued on. She's long, she's level, she milks like a cow. Overall exactly what we have to expect from these lines. Another Surprise/Miss Fortune cross that works exceptionally well. This girl is deep, long, standing on dynamite feet and legs with a beautiful udder that is glued on. Smokie is a beautiful young doe who is very productive. 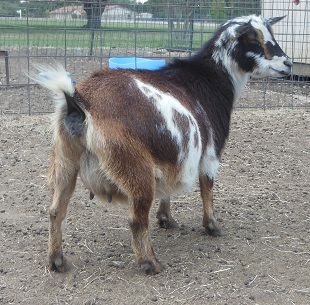 Her udder is exceptional with perfect teats and teat placement. One of my favorite young does. 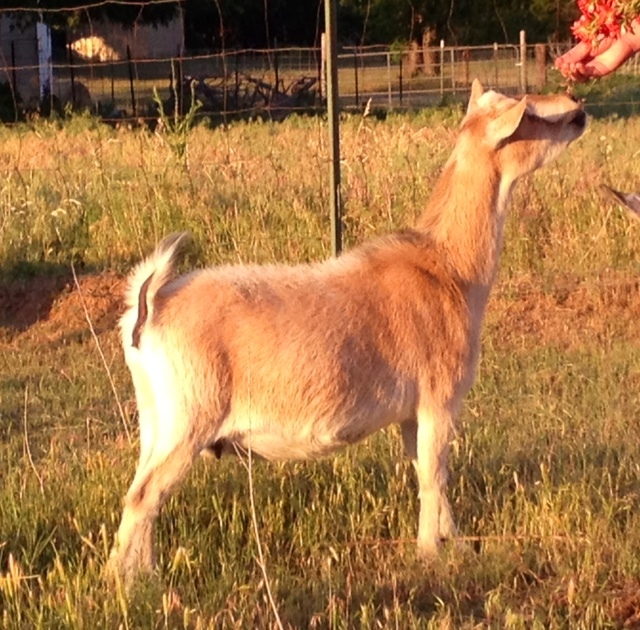 Butterbeer consistently produces exceptional kids and is a beautiful doe in her own right. This is a truly exceptional doe. Her first freshening udder was very impressive. We are happily awaiting her second!